We would love to have your support - the best way to help is to talk about what we do and help us raise awareness about our work or raise funds so we can continue supporting thousands of unpaid carers living, working or caring in Hertfordshire each year. We can provide speakers to talk to your group or students about Carers in Hertfordshire - our mission and work and how third party support helps us to continue providing the services carers need. You could also nominate Carers in Hertfordshire as your Charity of the Year or Charity Partner – more information on this can be found on our Charity of the Year page. We know how much effort goes into planning fundraising events and we can support you with any fundraising you wish to undertake and provide tips to make it a success. We can also supply materials about the charity, which you can have available leading up to the event and at the event itself. One way students and schools support us is by taking part in the Dragons’ Apprentice Challenge, a business challenge. The Dragons’ Apprentice Challenge involves team of students from Hertfordshire schools and colleges being matched with a local business mentor (their dragon) and a charity or community group. Each team received £100 to start up their businesses and have an agreed amount of time to make their ventures a success and raise £1,000 or more. Any profit is then donated to their partner charity. For the 2018/2019 challenge we have been paired with a team from The Bishop's Stortford High School in Bishop's Stortford, one of 12 teams taking part in the challenge run by the Community Voluntary Services for Broxbourne and East Herts. Youngsters from the Samuel Ryder Academy in St Albans took part in the St Albans Centre for Voluntary Service (CVS) Junior Challenge for primary and junior schools. They received £50 to start and asked to make as much as they could. The teams raised an incredible £3,800 with a range of events such as disco, sausage sizzle, afternoon tea, stalls selling goods and food the pupils had made and more. The students ran 11 events including three sausage sizzles, a bingo evening, disco and stalls at festive events. They were supported by Linda Witts from Witts Moloney Solicitors in Hemel Hempstead. They won Best Display. A teacher said: "They all had a lot of fun whilst learning some valuable life skills including time management, team work, negotiation and communication. They would all tell you what a wonderful but nerve wracking experience the awards ceremony and presentation was as well as what a rewarding but difficult process the Dragon’s Apprentice scheme has been." The team worked with mentor Jo Beazley, from the Community Voluntary Services for Broxbourne and East Herts. They are one of 13 teams from 10 schools and colleges involved in the competition. The team made £100 from one event. 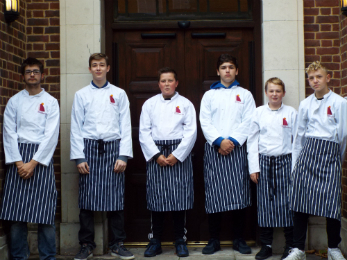 Eight students aged between 14 and 17 were involved in the challenge and worked with mentors Marie and Paul Clinton, owners of Restaurant on the Green, in Stevenage Old Town. They made chutney, cakes and other items to sell; had an afternoon tea and other events. The team raised a wonderful £1,710 and won several prizes in the contest - best poster, best innovative business ideas, most money raised and were the overall winners of the North Herts CVS challenge. Kate Robinson Lead Teacher - Food Preparation & Nutrition and Lead Teacher – Enterprise, at North Herts Education Support Centre, said: “North Herts Education Support Centre was excited to have taken part in the Dragon’s Apprentice Challenge 2017. This project helped students develop their confidence and social skills by working as part of a team and increased their organisational and job related skills." This Junior Team of eight students were supported by a Sixth Form Student, Khadija Zaman, who took part in the challenge before. The team was one of six competing in the Junior Dragons’ Apprentice Challenge run by St Albans Centre for Voluntary Service and they won the entrepreneurial award.